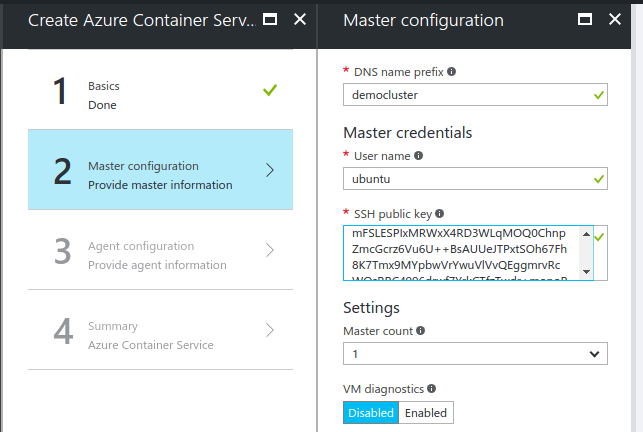 Azure Container Service (ACS) provided by Azure helps to simplify the management of Docker clusters for running containerized applications. ACS supports 3 Orchestrators: DC/OS with Marathon, Docker Swarm, and Kubernetes. 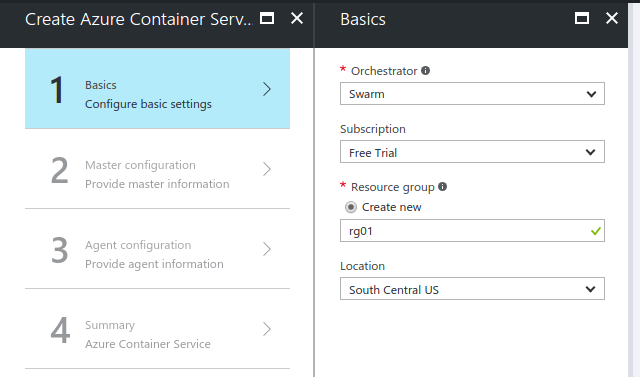 We are using Docker Swarm in this article for the demonstration and assuming that readers of this blog are familiar with containerization technologies such as Docker Swarm and a basic understanding of Azure portal. 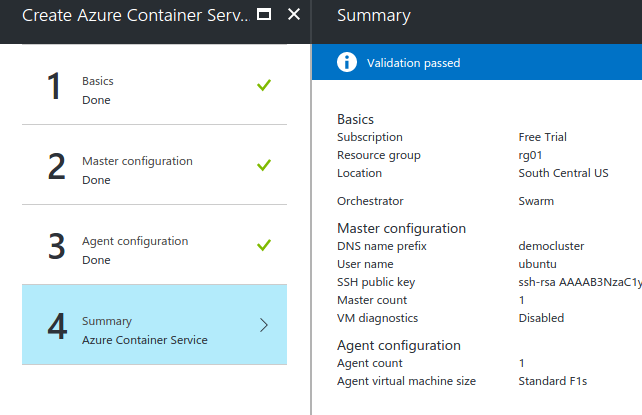 In the Azure portal, go to the Azure container services. Add a new container service and provide the basic settings. Choose Swarm for Orchestrator. Chose your subscription and, create a new resource group. You can also change location, but make sure that ACS is available in the region of your choice. For master configuration, chose a DNS name, master credentials such as username, public key, and the master count i.e. the number of masters for the cluster. Chose the agent count and select the machine size for Agent instance. You can review the settings before launching the container service. The resource group created with this container service will have many items such as the master, agent, storage accounts, load balancer, public IP addresses, virtual network, and virtual interfaces. Out of these resources created by the container service, we are interested in the container service “containerservice-rg01″. Click on it to see the overview of service. Note down the master FQDN, which will be used to connect to the container service. This command will ensure that the docker container that you create will be managed by the tunneled ACS master. The swarm cluster that ACS has created for us uses consul for service discovery. Now that the setup is complete, we can proceed and create a container. As a demo, we will create a Nginx container. However, it is advisable to check if any container is already running in the cluster. This load balancer created by ACS already consists of three rules corresponding to port 80, 443 and 8080. In case you have deployed an application which uses any other port, you will need to add the required rule manually. 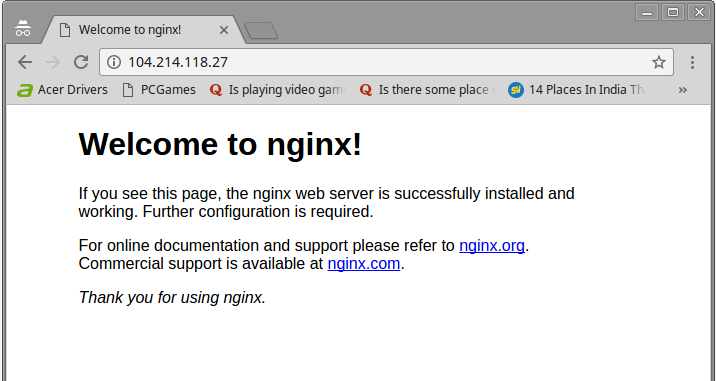 Now hit the IP address, and you will have your Nginx application running on the ACS cluster. Hope this blog was helpful. Do let us know if the comments below if you are able to follow the mentioned steps and use Microsoft Azure container service to deploy your stack.